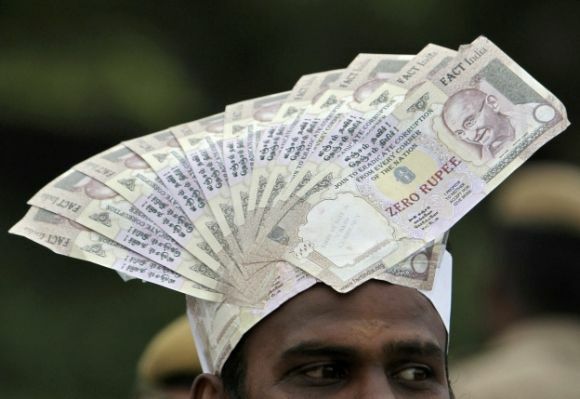 Rediff.com » Business » Does India really need a Pay Commission? Does India really need a Pay Commission? The Pay Commission process is symptomatic of a national crisis within the Indian state, says Rathin Roy. The government of India has implemented pay hikes drawing on the report of the Seventh Pay Commission, of which I was a member. My job done (to no one’s satisfaction, as is the nature of these assignments), I can now reflect on the more general process and context of pay determination in India. It is important to understand how pay awards affect behavioural incentives. The answer lies in the political sociology of our country. Recruitment into a government job is the only way to secure a permanent entitlement (unless you do something really silly) to lifetime employment, with perks and privileges that are beyond the reach of most Indians. While a minuscule proportion of qualified Indians may have the marketable skills to secure an equivalent or better lifestyle in the private sector (though not the privileges and immunities that being part of the state confers), those without such skills have to take their chances in a system of hierarchical examinations to enjoy a life that is at least middle class. The exams are designed to let as many people as possible apply - the minimum qualification and experience required of an applicant for the post of Sub-Inspector of Police is the same as for an Indian Police Service officer. At the top of the examination hierarchy is the UPSC examination, and then a series of central, state and parastatal examinations for entry into different government “cadres”, with the constable, postman, etc, at the bottom. All those who succeed have a job for life, with a career path and access to entitlements determined by examination performance. This system has remained unchanged since the 1960s. If anything, distrust of political and baba-log cronyism has further entrenched it. This conflicts with modern expectations of a civil service - competency-based recruitment, performance-based pay and promotions, liberal entry and exit from government etc. Hence, all modern methods of performance appraisal in the Indian civil service – confidential reports, performance contracts, etc – are optical, capricious and ineffective exercises. In these circumstances, the fixation of pay becomes an exercise in deciding how much the bottom should be paid, and then fixing the pay of the very top. There is then a tradeoff between what is fiscally feasible with the desire of all civil and military employees to use the decadal opportunity to extract as much as possible from the public exchequer. Once this is done, the rest is an exercise in reconciling the relative envy of government employees vis-a-vis each other. The exclusionary socialism implied in the examination-based lifetime recruitment system, combined with the abandonment of any pretence at integrated personnel management at the executive level, has been devastating. Executive decisions – such as parity between the IAS and other services, the relative position of a constable versus a jawan, etc – are referred to the Pay Commission by a pusillanimous executive leadership. The civil service associations (and the military) then spend most of their time arguing about relative pay - an infantile exercise in the politics of envy, made all the more unseemly by their willingness to carry out this bickering in the public domain. This bickering further demoralises, confuses and denies voice to the many individuals with leadership qualities who join civil or military cadres with a vocational call to public service - a dreadful externality. This situation has degenerated to an extent where the military argues for higher pay in specific grades on grounds that this alone will establish their operational authority over civilian counterparts in forward areas, where the country’s premier civilian service – the IAS – argues that they, alone, should be given a special increment to establish their primus inter pares authority. They argue, without any sense of irony, that their leadership and authority can only be established by being paid more than their counterparts. The top echelons assert their right to “comparable” private sector pay, while arguing that those below them are paid too much, futilely seeking to replicate a market-based pay structure within a closed shop. Since authority in hierarchy depends exclusively on seniority and type of (and rank in) examination taken, not on ability to lead a team to deliver results, the conversation on pay understandably becomes one about status and authority. Pay is status and status confers authority. Leadership is not in the picture. There is no question in my mind that, as we said in the report, there should be no more pay commissions - but this is easier said than done. The political sociology of the country and the resultant feudal government ecosystem will have to be reformed first. We are in a vicious circle - the only means of protection against nepotism and exclusion is a government job and a government job facilitates nepotism and exclusion. To break this, bold and politically controversial administrative reforms will be required. We know what these reforms are - several administrative reforms commissions have outlined detailed road maps for such. These are studiously ignored by the executive, political authorities and the commentariat, because the political sociology of India makes it impossible to implement these reforms without incurring significant political costs. The Pay Commission process is thus symptomatic of a national crisis within the Indian State. Blaming the bureaucracy, politicians, or each other, for this malaise is futile. We are collectively culpable, and have a collective responsibility, to mobilise politically to resolve this crisis. The writer is director, National Institute of Public Finance and Policy. 7th Pay Panel: How much salary will Indian bureaucrats draw?